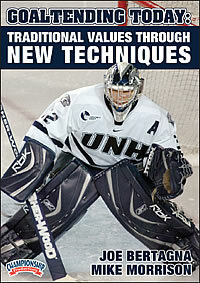 Former Boston Bruins goalie coach Joe Announcing a new instructional DVD from Joe Bertagna! Former Boston Bruins goalie coach Joe Bertagna has completed his fourth DVD for Championship Productions of Ames, IA. This one is titled, "Goaltending Today: Traditional Values through New Techniques." Filmed with former NHL netminder Mike Morrison, and enhanced with UNH goalie coach Mike Buckley, this DVD shows how many of the newer techniques employed by today's top goalies are used to reach familiar goals of proper positioning and puck control. Morrison, a Medford, Massachusetts native who starred at the University of Maine, demonstrates throughout the DVD. Buckley, a former Bertagna student like Morrison, trained Morrison as a pro and is one of New England's young cutting edge coaches. Bertagna, a former Harvard University goaltender who has directed his own schools for four decades, wrote and produced the DVD. He also serves as the commissioner of the nation's top Division I college hockey conference, Hockey East, and is in his 20th year as the Executive Director of the American Hockey Coaches Association. Listed at $29.99 each through the publisher, all four of Joe's DVDs are available from Joe for just $25 each! Click here for the order form if you would like to order the any of Joe's DVDs. Remember to add $5.00 per order for postage and handling.